French 18th-century light brown morocco, gilt tooled. Gift of Mrs. Gilbert Zuellig, in honor of the 75th anniversary of the Morgan Library and the 50th anniversary of the Association of Fellows, 1999. Le Large, 1630 (inscription on end pastedown); Thomas Rubert de Laning, 1818 (inscription on end pastedown); Mrs. Gilbert Zuellig; gift of Mrs. Gilbert Zuellig in honor of the 75th anniversary of the Morgan Library and the 50th anniversary of the Association of Fellows. Ms. book of hours, Rome use (Hours of the Virgin, Office of the Dead); written and illuminated in Paris, France, early 16th century. Texts: Additional prayers (fols 3-4v); Calendar (fols 5-7v); Gospel readings (fols. 8-10v); Hours of the Virgin (fols. 11-40v); Hours of the Holy Cross (fols. 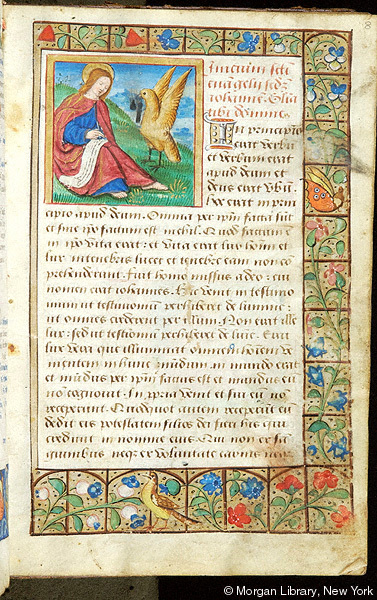 41-42v); Hours of the Holy Spirit (fols. 43-44v); Penitential Psalms (fols. 45-50); Litany, Petitions, Psalm 69 (fols. 50-53v); Office of the Dead (fols. 54-71v); Obsecro te (fols. 72-73v); O intemerata (fols. 73v-75); Suffrages (fols. 75-81); Passion of Christ according to John (fols. 81-85); Additional Prayers (fols. 86-87v). Decoration: 12 large miniatures, 24 small miniatures, 159 full-page inhabited foliate borders. Musical notation: on fol. 22v, 3 4-line staves with musical notation on the scroll held by the angel in the Annunciation to the Shepherds miniature. Artist: Master of Phillippe of Guelders and workshop.